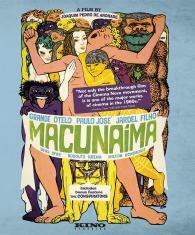 One of the high points of Brazil's subversive Cinema Novo movement, Joaquim Pedro de Andrade's Macunaíma (1969) is an anarchic comedy that mixes ancient myths, racial burlesque, and urban guerillas into a hallucinatory masterpiece. Adapted from the classic 1928 modernist novel by Mário de Andrade, the film follows Macunaíma, the "hero with no character," after he emerges as a full-size adult from his mother's belly. Born black, he magically turns white as he wanders aimlessly across the country, tricking his way through traps laid out by witches and giants, while also falling in with a beautiful revolutionary. Thumbing its nose at the authoritarian government then reigning in Brazil, Macunaíma is a vibrant and politically combustible comedy at the cutting edge of the Tropicalist avant-garde. This Kino Classics release also includes two short films and Andrade's subsequent feature, The Conspirators (1972), a historical reconstruction of a failed coup during Brazil's colonial period.